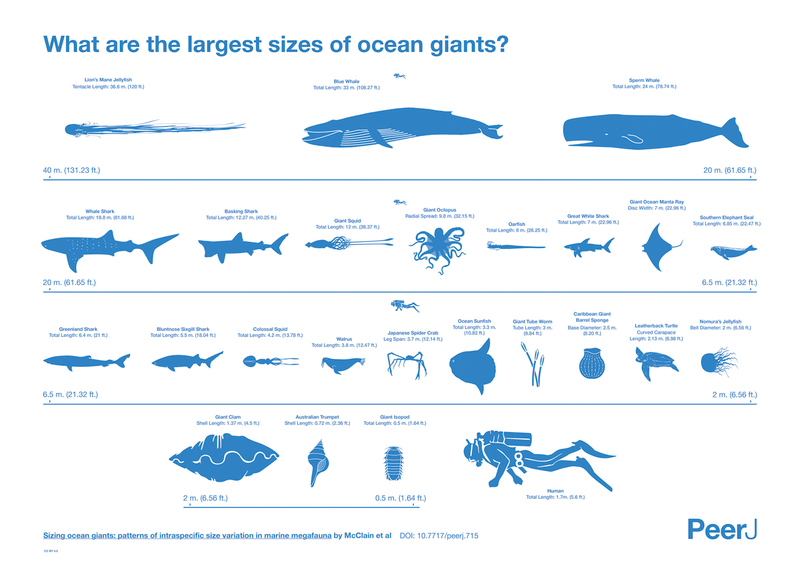 The largest living representatives of most taxa occur in the oceans… Today, these formidable species, such as blue whales and giant squids, continue to attract considerable attention from scientists, media, and the public alike. However, misconceptions about the sizes these species obtain are just as rampant in the scientific literature as the popular media… Quantitative knowledge of body size is vital as it is a significant determinant of an organism’s biological role; and size is the key underlying parameter of many allometric equations that predict a variety of physiological, anatomical, ecological, and life history parameters. Species were chosen that frequently occur in the mainstream media and where sizes were often misreported. Additional taxa were added when data were accessible. A thorough search of the available literature was conducted to find size measurements for the species covered here. Matthew Maxwell and Pablo Alvarez Vinagre of StudioAM used the information in the research paper to create the chart/infographic above. See here to read the full paper. To learn what inspired McClain, check out this feature by National Geographic.